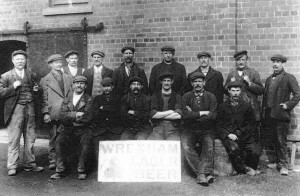 Wrexham Lager Beer workers, circa 1910. Now to be clear it is not quite official. The brewery has sent samples to Blue Star and got a positive reaction writes Daily Mail. So the next step is the legal one where documents are signed to license the beer as the official beer of Titanic II. Wrexham Lager produced a range of lagers under different labels. The Munich style lager was apparently the one used on Titanic. According to Titanic lunch menus that survived, they were served “iced draught Munich lager beer.” Wrexham Lager went out of business in 200o but was relaunched in 2011 by Mark Roberts. Industrialist Robert Graesser bought the majority share in 1886 and secured major contracts with Great Western Railway and British Army. He apparently traveled on a White Star liner to America and took a keg of beer to market it. Apparently it became popular in this country and shipping lines like White Star decided to stock it.